This week's featured teacher is Monica of I Heart Grade 3. What is your favourite part about teaching? Watching the personal and academic growth of my students throughout the year. What is your best advice for a beginning teacher? Find a mentor who is willing to help you out! Ask a lot of questions and remember the difference between a critique and criticism. Give yourself at least 3 years at the same grade level to feel comfortable! I was lucky enough to meet Monica in Las Vegas this summer. 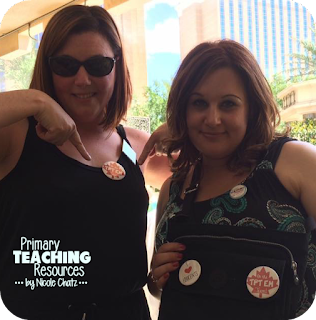 Here's a photo of us hanging out by the Palazzo pool, wearing our TpT Eh Team buttons! Monica is on the left, and I'm on the right. 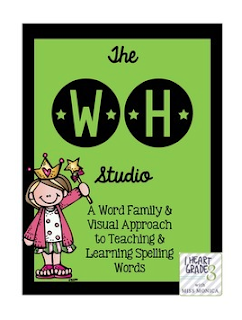 Monica would like to share her word family approach to teaching and learning spelling from her TpT Store. You can download the file by clicking on the picture below. If you download this freebie, don't forget to leave Monica some feedback for her generosity. You can do this by clicking on "My Purchases" and finding the download in your "Free Downloads" tab. Don't forget to check out Monica's I Heart Grade 3 blog for a peek into her Canadian classroom! Thanks, Monica, for participating in this week's Teacher Feature.